Hello people! Anybody knows who made this knife? Is it a production model or a custom made? Bigger and brighter pictures might say a lot. If this is a knife for sale, I am reluctant to say much past it looks like someone had a lot of influence from Gil Hibben. 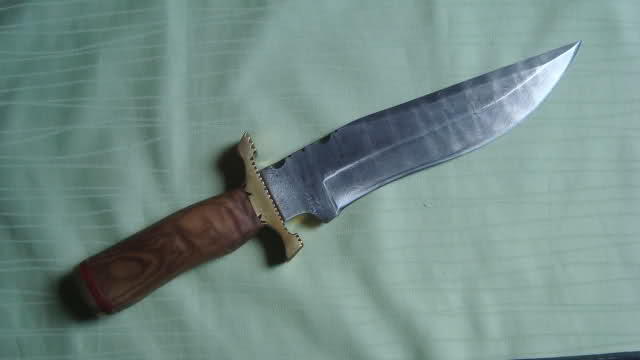 It is, in a lot of ways reminiscent of some of the recurve kenpo knives that were made up but it is kind of a cross of that and the much larger Highlander bowie, ala United Cutlery. 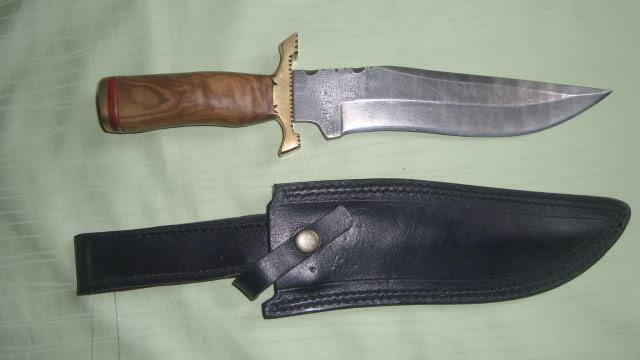 The grip is very wrong if considered a custom Hibben but much of his work is a bit iconic and styles used by the masses of grinders. The guard and overall profile offer the first impression as Hibben work (but not). Any marks or more information? Do you own this piece? I don't recognize it as production but check Frost Cutlery "Warriors" and some other popular Hibben styles. It may well be a one off custom but without a mark, your guess is as good as anyone's. KMA Traders appears to be importing from Pakistan and other sources. No doubt that it is probably folded steel. There is a lot of steel in this fashion being sold as bith finished knives and blanks. The SRK sells for considerably less in the US than what you list and I guess the bowie you show is worth it if you like it. Seems way overpriced for what a similar production third world knife would fetch here in the states. The knife market can be tricky to gauge in reselling because there are so many discounted brand new knives. On the higher end of demand and popularity, finer swords are a much better price per inch my fairly small collection that includes some of the higher class knives can hold value depending on the markets whim. I know I would have a hard time getting back full dollar on my couple of Vince Evans and a Kevin Cashen, while the Blackjacks and Randall would easily fetch more than I paid. Your SRK looks similar to my old 1990s Blackjack AWAC. For general utility, the simple knives are really more useful than the niceness of folded blades. With that said, my Vince Evans bowie was more expensive than some swords but a lot less than one would pay for an Albion Next Generation. For a long time, it was my most expensive blade. The Cashen bowie a real treat and much more worth pursuing than imports you are considering. There is a fair amount of an international market for knives that may save you some money. Check out the production and custom listings on Blade Forums (just a for instance). Even Ebay. Some of my fixed blades and a couple of folders below. The hunter with the inlaid silver wire was a custom a friend owns and the khukri, Himalayan Imports. That was actually a prize from Russ Ellis here and has since been passed on to another as a gift. My one Cold Steel is the Taipan next to those two on the left and the blackjack AWAC on the right next to the big Gerber BMF. As mentioned, the smaller knife generally a lot more useful but not as pretty as the stag handled bowies.